What does the anarchists of Belarus stand for? What are the goals of the anarchists? Some anarchists are focusing on social transformations, saying that the purpose of the movement is the abolition of the institutions of power and the replacement of their self-government structures. Others complement this idea, stressing the need to spread a new lifestyle and new values, corresponding to the anarchist ideal of a free and responsible person, actively involved in the management of their own life. The ideas of the new society and the “new man” for anarchists are closely connected. For their realization, there is a need to create horizontal relationships at all levels: from interpersonal interaction to ways of making decisions regarding millions of people. In the economy, the realization of the principle of plane means the creation of networks of production and consumer cooperatives. These structures will allow both small and large producers to negotiate directly with consumers about the supply of the right species and the right amount of products. On the opinion of the anarchists, such an economic model will solve the problem of economic inequality and change the attitude to the environment, as it will not be aimed at maximization the profits of individual players but on the sustainable development. Some anarchists claim that such an economy does not exclude competition, but the latter will be shift in the area of quality of products and will not affect the economic welfare of the “losers” competition. In the sphere of decision-making, anarchists advocate the organization of a step-by-step system of self-Government, where all basic powers will be in the hands If necessary, local assemblies will be able to guide their delegates to coordinate at the level of the area, city or whole region. At the same time, some anarchists believe that at the grass-roots level, it is possible to create organs with limited power powers, but they will have so little opportunities and so much controlled by local assemblies, which will not threaten a horizontal public structure. For such a system to work, celebrate anarchists, it is necessary to spread a new culture based on equality, respect and pluralism. All divisions on racial, ethnic, gender and other grounds will not create hierarchies. What methods implies anarchism to achieve its goals? All anarchists agree that the ways of approaching anarchist ideal can be the most different and depend on a specific public-political situation. Anarchism involves a wide range of practices: from educational activities, symbolic street shares or publishing activities to the armed resistance of power. Some anarchists believe that an important activity is the organization of alternative horizontal institutions meeting the needs of participants: Housing projects, production and consumer cooperatives, educational initiatives, etc. It is expected that the numerical growth of “Alternative Society” can lead to a conflict with power institutions, which will create Revolutionary situation. Part of the anarchists among the ways of realizing social transformation is called active inclusion in existing social movements: Working, women, environmental, anti-racism and others. All these methods and practices unites the principle of direct action, meaning that the oppressed to exercise their rights act on their own without resorting to the help of any representatives of the power and without creating a hierarchy in their movement. In other words, direct action is the alignment of goals and means. What are the examples of the incarnation of undisciplined ideas in practice? There is no example of the realization of the anarchist ideal, which would be absolute, and the mass and long-term. This has many reasons. Some major attempts to create anarchist structures are forcibly are by the state. This was the case with agricultural communes and self-control industrial production in catalonia of the civil war in 1936-1939 and with the 1918-1921 mahnovskim experiment (http://www.makhno.ru/lit/book2.php). Part of the projects to create an alternative society is born, integrated over time into the environment. For example, Israeli kibbutzim, the commune of Aurovilâ in India and the mondragon cooperative in Spain. However, there are a number of examples of the realization of anarchist or close to anarchism experiments today. These are whole regions like the Mexican state of chiapas and the autonomous cantons of Syrian Kurdistan, many production and consumer cooperatives around the world, occupied by workers in 2001 in ARGENTINA FACTORIES (e.g. plant plant). In the political sphere, the coordination of the world alʹterglobalist movement, the “Occupy Wall Street” Movement, the “nuit debout” or “Yellow vests”. In the interest of what social groups changes offered by anarchists? In the first place, in the interest of those social groups that experience at least one of the kind of structural oppression or do not have the possibility of equal participation in decision-making, which directly relate to the conditions of their And such, by the way, the vast majority of the population. In the interest of employees who will finally be able to dispose of their labor, time and skills. Women who will become just people, not “second floor”. men of lower and middle classes who will not die in wars for the interests of elite. People with special physical needs, for which there are resources and opportunities to create an inclusive environment. People suffering from pollution of the environment and the destruction of nature. As a rule, anarchists imply that all these seem to be ” narrow ” and ” individual ” interests internally interrelated and can be included in the general project of social transformation. The massive anarchist transformation of society is a long and difficult process. But what specific changes of anarchists offer to commit already now? When it comes to specific and relevant social transformations, many anarchists have already been hard to formulate a specific answer. .• to empower local authorities with great powers. This will make power a more transparent and controlled society. In those areas where possible, it is necessary to convert these organs to local assemblies. What is the anarhičeskoe movement of Belarus? 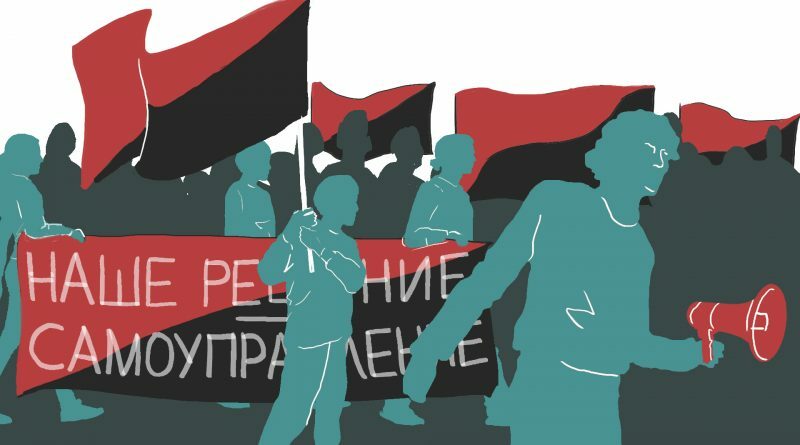 Many anarchists say there is no anarchist movement in Belarus if under the movement to understand a certain mass force capable of influencing the socio-political situation. Instead, there are a number of activist groups, communities and individual people sharing anarchist beliefs and leading work to create a full-fledged movement. Among them: free food distribution “Food not Bombs” (https://vk.com/fnbminsk), Media Collective “Pramenʹ”, “Anarchist Black Cross” Initiative (https://www.facebook.com/pages/ABC-Belarus/), Libertarian Library “FREE THOUGHT” (https://dumka.be/) and Really Free market Minsk (https://www.facebook.com/reallyfreemarketminsk/). The main difference of anarchists from other political forces of Belarus is the lack of desire to get into power. Some anarchists see dishonesty and opacity that politicians use the discontent of some social groups or some social conflicts to ” gain political glasses “, which will eventually help them take a place in ” big offices ” and enjoy Such a level of life that will be unavailable to most of the ones with whom they are today, as it seems, together. The Anarchists, on the contrary, directly and openly declare their interests not different from the interests of the majority of the population. How to join the anarchists of Belarus? In General, it is necessary to meet some of the anarchists and engage in the work of one of the initiatives. For example, visiting open events like Food not bombs, or Freemarket. many anarchists note that it is difficult enough because the repression has to comply with a number of security measures. In addition, it is possible to create an autonomous initiative or group, and the thinkers will be sure to contact.